For the holidays, try out The Early Show resident Chef Bobby Flay's recipe. He has taken the base ingredients for the tradition brulee custard and fashioned a dessert with a signature all his own. The crust will likely be pre-prepared (made from scratch) and spread in a shallow Pyrex pie plate. Place the flour, sugar and salt in the bowl of a food processor and pulse 2 times. Add the butter and shortening and pulse until the mixture resembles coarse meal. Add the water, tablespoon by tablespoon, until the dough just starts to hold together. Remove the dough to a lightly floured surface and gently form into a disk. Cover with plastic wrap and let chill in the refrigerator for at least 1 hour, or overnight. Preheat oven to 375 degrees F. Roll the dough out into an 11-inch circle, 1/8-inch thick. Fit the dough into pie plate, trim off excess and flute the edges of the dough. Place the shell in the refrigerator while you prepare the custard. Preheat oven to 350 degrees F. Position the oven rack in the lower third of the oven. Whisk together the eggs and sugar until pale. Whisk in the milk, coconut milk, vanilla and salt until combined. Stir in the coconut and pour the mixture into the prepared chilled crust. Place the pie on a baking sheet and bake for 50-60 minutes or until the crust is golden brown and the pie jiggles slightly in the middle. Place on a baking rack until cooled to room temperature. Place in the refrigerator until chilled, at least 1 hour. 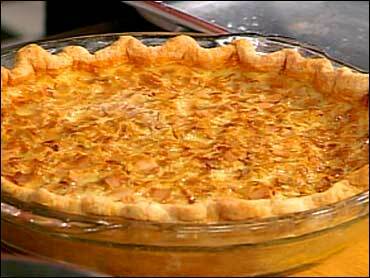 Sprinkle the turbinado sugar evenly over the entire top of the pie and run a blowtorch over the top until golden brown. Serve immediately. If you do not have a blowtorch, preheat the broiler of your oven and place the pie, on a baking sheet, under the broiler for 30-45 seconds.